Combining fragrances can help you design a unique candle scent. Mixing candle fragrances is a skill that takes lots of practice, but the ability to create a uniquely appealing scented candle is in high demand. According to numerous consumer surveys, fragrance is one of the top factors customers look for when purchasing candles for use in their homes. Aromatherapy is a great way to experiment with interesting fragrance combinations. 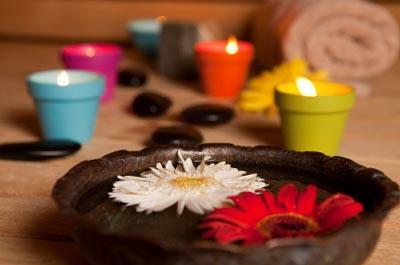 Aromatherapy blends can be used to create candles, scented soaps, body lotions, or other personal care products. When looking for creative candle fragrance ideas, think about the scents that you associate with certain memories or events. Whether it's your grandma's kitchen or the perfume your mother wore when you were a child, inspiration for creating unique scented candles is all around you. Until you're sure what scent you want, make small batches of candles. Votives are a good choice for testing different fragrance combinations. Use a light touch when adding fragrance oil to your candles. Too much oil can create an overpowering scent with too much soot or uneven coloration in the wax. As a general guideline, use one tablespoon of oil per pound of wax melted or three percent of the candle's weight. Take careful notes of how much of each fragrance you used to create your candle. Once you find the results you like, you'll want to be able to duplicate the scent again. Before you plan to sell your handmade candles, have several different people burn your test votives to see what they think of the scent. Fragrance preferences are highly individualized, so it's important to get a variety of opinions before adding to your product line.